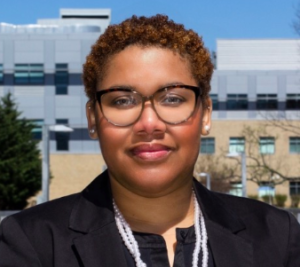 Tiffany Thompson is the CEO of Digital Scholars Consulting, an educational technology consulting company focusing on helping schools develop 21st century teachers and students. She is a Senior Instructional Technology Specialist with over 18 years in the education field including experience as a classroom teacher, technology coordinator, trainer and college instructor. Tiffany is a first-generation college graduate who grew up in Baltimore, Maryland. Some might say that life was challenging for Tiffany. However, she will tell you that “Every experience in life is a journey of connected roads that lead you to where you are to be at any given moment”. While she experienced some “challenging” moments, they made her resilient, driven, focused and benevolent. Tiffany was raised by a single mother in public housing in Baltimore. She attended a few Baltimore City Public Schools. At the age of 11, Tiffany’s mother enrolled her in catholic school to give her better opportunities and experiences. She excelled academically earning many awards and achievements despite facing hunger and homelessness at times. Upon high school graduation, Tiffany attended Coppin State University and obtained her Bachelor of Science degree in Early Childhood Education. She loved working with children and wanted to give back to her city and neighborhood. While working as a teacher in Baltimore, Tiffany was attacked by a student; and through that experience she decided to apply for Baltimore City Schools’ Teacher Exchange Program. Becoming an exchange teacher was THE experience that changed Tiffany’s life. She lived and worked in Japan for over four years. There, she gained a love of technology, love of travel and the love of her life. While in Japan, Tiffany completed graduate school and earned a Master of Science degree in Education with a focus on technology. From teacher to CEO, technology has had a large impact on Tiffany’s career. In 2013, when she decided to leave her full-time job to create a technology training company, she knew it was going to be a difficult yet rewarding road she was willing to take. She pushed through the fear and roadblocks and chased her destiny. She started Digital Scholars Consulting, LLC. It has been a long five years. However, Digital Scholars currently has a team of 8 trainers and is a desired training company for local and national schools and universities. Digital Scholars is the only minority owned Microsoft Global Training Partner. Tiffany and her team consults and trains nationally on instructional technology solutions, tools and products. Tiffany facilitates online workshops and teaches at a local college. She is also a Microsoft Master Trainer, TedX Speaker and local and national conference presenter. Her enthusiasm for technology has inspired her to help large and small school systems and educational institutions transform the teaching and learning process by personalizing educational experiences to develop digital scholars. She has a special place in her heart for underprivileged students and loves working with those students and their parents; helping to develop a love of technology outside of entertainment. She is consistent in her efforts to build essential skills that can transfer to an applicable and sustainable career. Her philosophy is, “To prepare for 21st century work including entrepreneurship, we must increase opportunities for all students to engage with technology in ways that extend their personal limits and potential”.